The Patriot Series sprayers provides consistent, accurate application across every piece of ground, all season, every season. The Patriot sprayers offer exceptional space to work in, allowing operators to stretch out their legs during those days when long hours of spraying are required. Vast amounts of cab glass and a well-thought-out cab design offer unrestricted visibility to the front and sides when traveling down the field or maneuvering around obstacles. Inside, the seat-mounted control console moves with the seat for near-effortless operation of sprayer controls. The AFS Pro 700 color display can be mounted on the control console or on a separate mounting bar for line of sight visibility of rate control and guidance functions.​ To maximize your crop’s yield potential, product needs to be applied at the right agronomic moment. 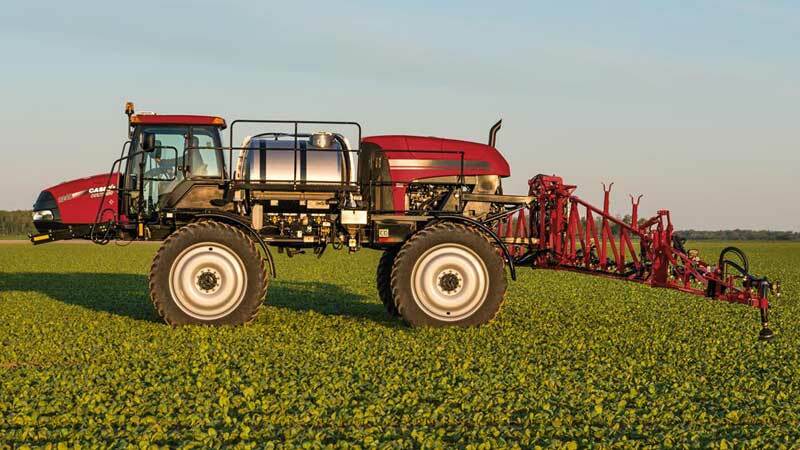 The cab forward, rear engine Patriot sprayer design means even weight distribution across the machine, getting growers into the field earlier while causing less soil compaction and maximizing on tight operating windows.​ Both growers and commercial applicators know that timeliness and application quality are critical. Most often, you're facing long days and short application windows. That's why you need a sprayer that optimizes your time and provides accuracy in any conditions. Patriot sprayers offer the most advanced spray technology on the market. Agronomic-ally designed with function in mind, Patriot sprayers allow you to do your job quickly but efficiently every time.